The venue is DhalPur Maidan - a fairlY large rolling ground on one end of the main Kullu town, which is located on the right bank of river and the occasion is a- yearly fair. The Place is approximately 530 km from Delhi; 240 km from Shimla; 90 km from Joginder Nagar and 300 km from Pathankot with direct buses and taxies available aplenty. A daily flight also operates from Delhi via Chandigarh and Shimla which lands at Bhuntar, just about 10 km short of the main town. Kulllu with an altitudte of 1224 m, has a pleasant whether during October. i.e. Dussehra days. ln case of unexpected rain, hail or snow the area may become quite cold and the visitors should, therefore better come with adequate winter garments. Dussehra an important lndian festivel symbolizes the return of Shri Ram, to Ayodhya, on completion of his 14 years of exile after vanquishing Ravana, the demon king of Lanka. The Dussehra of Kullu has an interesting folklore. During 17th century, Raghuvanshi Rajputs, reverently called 'Thakurs', ruled Kullu. One of their scions, named Jagat Singh, ascended the throne in 1637 A.D. A brave and kind young Jagat, .got misinformed by someone that a particular brahmin among the subjects Possessed certain valuable pearls. He ordered the Brahmin io deposit the valuable pearls in the treasury. To escape his wrath the poor man committed self- immolation along with all members of his family. Leaving a curse on Jagat Sinqh who fell seriously ill. A minister named Kishan Dass advised him to obtain the ancient idols of Shri Ram and Sita from Ayodhya, install them in his royal palace and worship. 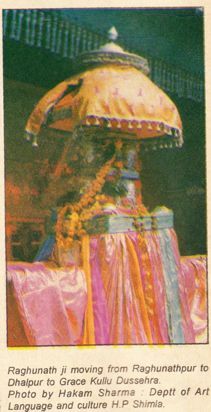 Jagat Singh acted accordinglY and installed the idols obtained the idols from Ayodhya and installed in his palace. The event coincided with the Dussehra day. The Raja, further bequeathed the governance of the kingdom to Shri Ram, the idol, and declared it as the governing deity of the State giving it the title, 'Raghunathji' or 'Thakur'. The Palace became 'Raghunath Mandir' and the roYal word "Raghunath Pur". Further, the king himself become the 'Pujari', or the caretaker Priest of the deity, so established. The above Penance rejuvenated Jagat Sirgh's health as well as morale. On hearing the above development all the local PeoPle carrying their respective village deities converged to 'RaghunathPur to PaY obeisance to 'Raghunathji', the new Thakur or Raja. Gradually this became a regular ritual and called "Kullu Dussehra'. fabrics, utencils, cosmetics etc., modern luxury items brought by traders from the plains. The people of Lahaul & Spiti and Ladakh also came to the fair in large numbers to avail of the festival. ln olden days traders from Tibet, China, Yarkand, Kandhar etc. too used (o come to the fair, bringing pashmina wool, gold and golden ornaments, precious pearls and stones and barter these for salt, rice, tea etc. 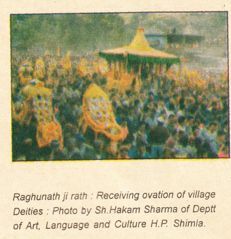 On the lastday of the celebration; the Raghunathji's Rath is pulled by the devotees further fown - to a point closest to the right bank of river Beas. Here dry grass and brushwood are burnt in the same way as in the plains, to mark the end of evils like the ' one committed by Ravana. Simultaneously one buffalo, one goat, one pig, one crab, one chicken and one fish are slaughtered for sacrifice. Thereafter, the 'Rath' is pulled back to its permanent parking spot and the village dieties pay their closing homage to 'Raghunathji' - before His retreat to RaghunathMandir. And, then, the village deities and villagers too disperse - slowly and jubilanfly. A word about the people. The ' Kulwis' are self-respecting graceful folks. They are respectful, even affectionate - towards well-meaning outsiders, but tough towards those who take undue liberties. Same is true about the police as well. The Govt. of H.P. . makes elaborate arrangements for the transport, accommodation and entertainment of the visitors coming to witness the Kullu Dussehra. The requirement is met by the large number of hotels, motels and guest houses recently raised in the valley in addition to the old rest houses and circuit horses.